Most people know that beans like pinto beans, black beans, navy beans and baked beans make you fart. But just why do these popular legumes make your body so gassy? Also, if you still choose to eat beans, which are actually quite a healthy and high fiber food, how can you greatly minimize the amount of flatulence they cause? 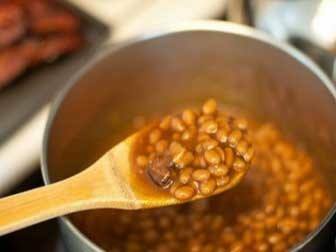 Boiled beans, and even canned baked beans, are high in fiber and loaded with vegetable protein. They are also low in fat and contain minerals like magnesium, calcium, phosphorus, potassium, copper, and zinc. Beans like kidney beans, fava beans and pinto beans are a great source of B vitamins, particularly folate and B1. Canned baked beans also contain some B vitamins, though they do have much more sodium and bisphenol A from plastic can linings may be an issue. All forms of beans are rich in soluble fiber, which is considered beneficial for digestive health and preventing constipation. Unfortunately, it’s this same soluble fiber that also behind the stomach gas, belly rumbling and excessive gas when you eat them. The way baked beans make you fart starts with oligosaccharides such as raffinose and stachyose. These indigestible carbohydrates are not absorbed in your small intestine during digestion. Instead they pass through to your large intestine intact. While the digestive processes of the small intestine cannot break down oligosaccharides, the bacteria in your colon thrive on them and produce large amounts of hydrogen, nitrogen and carbon dioxide gas through bacterial fermentation. Eating foods high in raffinose and other oligosaccharides, like pinto beans or baked beans, usually leads to an increase in gas-causing bacteria in your lower intestine, and a corresponding increase in bloating, farting and other symptoms of gassiness. Can You Have Beans Without Farting? Soaking dried beans overnight, or for at least 12 hours before cooking them can greatly reduce the amount of gas-causing oligosaccharides they contain, as well as mineral binding phytates. To do this, drain out the water you’ve soaked them in and then boil them in new water. Ideally add some gas combating fennel seeds or fresh ginger near the end of cooking to further improve beans digestibility. Obviously, this is not a good option with a canned product. So, can you still eat baked beans and greatly reduce the way they make you fart? The reason why people have problems digesting beans is that we lack the alpha-galactosidase enzyme in our digestive tract. This enzyme breaks down indigestible oligosaccharides into smaller components so they can be digested. For many years, people have taken a product called Beano, which contains alpha-galactosidase to help prevent gas from beans. Now there is a better and cheaper option called Bean-zyme. It contains alpha-galactosidase like Beano, but costs less and doesn’t contain fish gelatin, so it can be used by vegetarians or vegans. The directions for Bean-zyme recommend taking two tablets at the same time as any meal containing beans, chickpeas, lentils or other legumes. You can also prevent gassiness from other oligosaccharide-rich vegetables like cabbage, mushrooms or broccoli with Bean-zyme as well. Most people will swallow them, but if you’ve had excessive flatulence from beans before, it would be worth taking an extra step to make sure that they are quickly dispersed in the digestive tract. Start by taking your first mouthful of beans. Chew them up and then pop in two tablets of Bean-zyme. They don’t have much of a taste so you shouldn’t notice them beyond the texture. Chew them up as well and swallow them down. Some people don’t have very strong hydrochloric acid secretions in their stomach and there have been are reports of tablets passing right through a person system. While this step is probably unnecessary for most of us, it does give the alpha-galactosidase enzyme a bit of extra time to work on breaking down the raffinose in your small intestine. Amazon have this bulk Bean-zyme at a price which is much less than Beano per capsule. It’s a relatively inexpensive product to keep on hand whenever you want to enjoy beans without farting. You can use it not just with dried beans and baked beans, but with any meal containing foods high in oligosaccharides like chickpeas, lentils, cabbage, broccoli, or large amounts of onion or mushrooms. Beans certainly aren’t the only type of food that makes you fart. There are many other causes of flatulence, such as poor digestion from eating too fast or too much, the lactose in milk, sulfur-containing foods, high fructose drinks and fruits, and even coffee or soda interfering with digestion. For beans and legumes though, as well as other gas causing vegetables high in oligosaccharides, taking this inexpensive supplement is an easy was to enjoy them without the gassiness. On flatulence you provided good and useful infos.I have two querries regarding this very issue. First,I observed two type of people one ok with beans and other having problem with beans.So those who are ok with beans why they are so mean why beans dont produce gases either they have alpha galactosidase or some other gases alleviating system and for other people vice versa. second,humans have been using beans for thousands years,and hopefully with aforesaid probs,why should we use an enzyme which naturally lacking our bodies to degrade problem causing oligosaccharides(pls dont confuse its use like other medicines foreign to our bodies),how to justify its use,is not it an interference to natural mechanism? Hi Azam and thanks for your questions. From my research humans don’t produce the alpha galactosidase at all and bacterial fermentation in the lower intestine would always have been the way beans and other legumes were broken down. It’s likely a healthier digestive system simply deals with oligosaccharides more effectively but there is still likely to be extra gas, even if it isn’t particularly smelly. As to using digestive enzymes, there are many different substances that people eat in modern foods and our overworked digestive tracts can probably use all the help they can get unless someone has a particularly healthy natural diet. I would like a solution instead of a pill if possible. Soaking dried beans is essential before cooking anyway, unless you have a gut made of iron. They always say to soak them overnight, which is roughly about 6 or 7 hours. So you could do this during a day when you’re around: A trick I learned a long time ago is to change the soaking water about once an hour. It really does help cut the gas-making down! Changing the water each hour to reduce the gas causing compounds is a good idea. What’s wrong with farting? This is why I eat beans! I tried using bread yeast in warm water to soak the beans in. I allowed them to soak for 3 hours before draining and rinsing the beans before I cooked them. This reduced the gas and set the beans up for a perfect texture once cooked. An added step is to have some yogurt before or shortly after the meal. The added assistance to help break down the carbohydrates before the beans get into your system really seems to help. I have been drinking lemon water first thing early mornings for over a month now. I have this gas causing problem in my stomach and has made me loose my confidence. It is a big hit for me at work place and social life. Please help me deal with this problem. I am vegetarian. I have approached a gastroenterologist and he said it is natural there is no such medicine to overcome this. I was advised to stay calm and stress free. I am sure thats not the only factor there is something definitely wrong. Try to concentrate on low gas vegetables instead for a week like carrots, celery, tomatoes, bell peppers, cucumbers, olives, spinach, Swiss chard, parsley, zucchini, eggplant and butternut squash. Once the excessive gas subsides you can reintroduce gas forming vegetables from the link one at a time and see your reaction to them. The pill isn’t bad for you, it is just an enzyme which allows it to be processed. I’m confused, I eat many cans of beans with no farting at all, is this actually facts? That’s unusual and not the case for most people. Throwing a thumb-sized strip of kombu (a sea vegetable that can be found in Asian markets and health food stores) in with the beans as they are cooking helps *tremendously*. Evidently kombu contains the enzyme that the human digestive system lacks to break down starches. Hooray for bean lovers! Thanks for your comments Errin. That’s good information on kombu for beans. Hello – what I don’t understand is why eating beans can lead to you starting farting as soon as 20 minutes later – far quicker than you would expect either the proteins or gas to travel through the digestive system. That is quick. If the gas is indeed related to the recently eaten beans then possibly the small intestine has had a strong reaction to the raffinose in the beans, rejected it and evacuated it to the large intestine where it quickly arrives in larger than normal amounts. Usually it would take much longer before a person gets a bad gas reaction from eating beans.